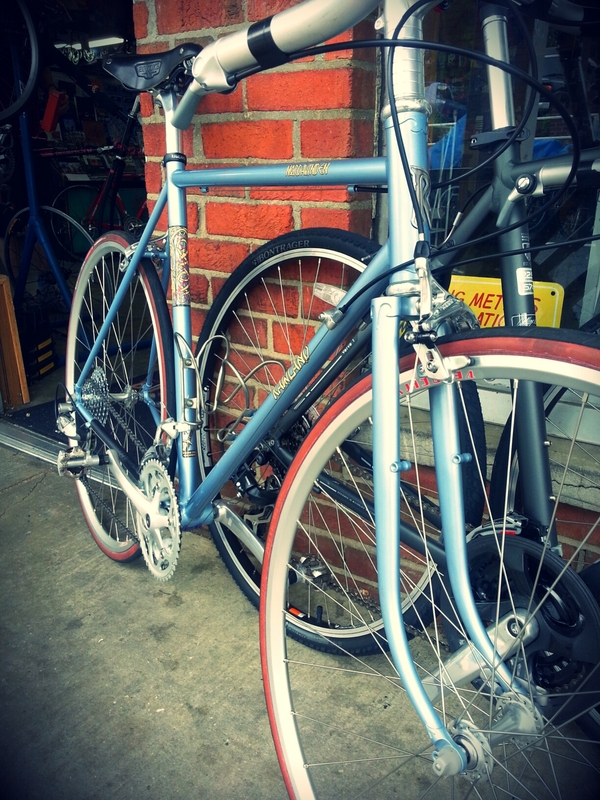 Felkerino and I celebrated New Bike Day at the Dining Room Bike Shop this past weekend. New Bike Day New Bike Day! This edition was particularly exciting, as 1. the bike was for me; and 2. I purchased the frame and fork in June of last year, but took another ten months to get the parts for the bike in order. The bike I purchased is a Rawland Nordavinden, designed by Rawland Cycles out of Danvile, California. Unlike the Rawland dSogns that Felkerino and I own which are a mix between a mountain and cross bike, the Nordavinden is meant to be a fast-ish touring “all road” bicycle. While I think it could be a little duplicative of my Rivendell Romulus in some ways, the Nordavinden appealed to me for several reasons. I wanted an attractive steel bike with a responsive feel that I could use for commuting, century bike rides, and the occasional 200K brevet. 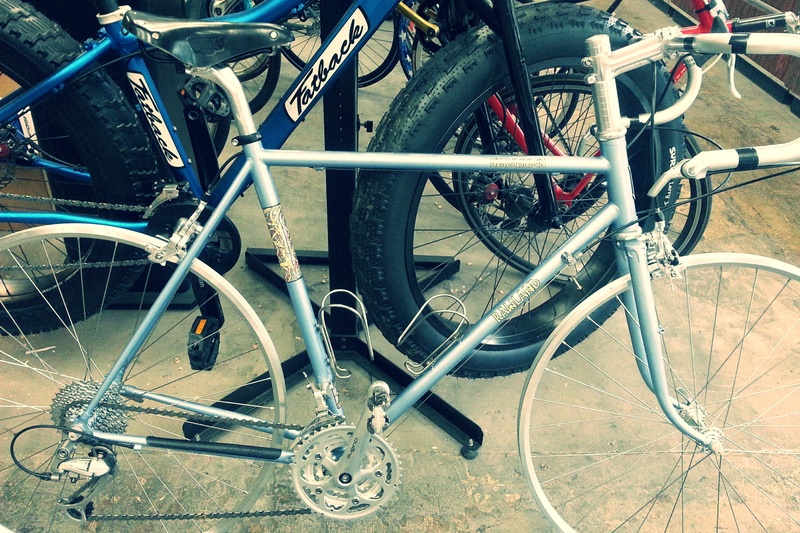 The Nordavinden is an icy blue-gray color with attractive decals and a little lug work on the fork and rear dropouts. I’m not a huge fan of lugs, but I find the lugs on this nice looking. 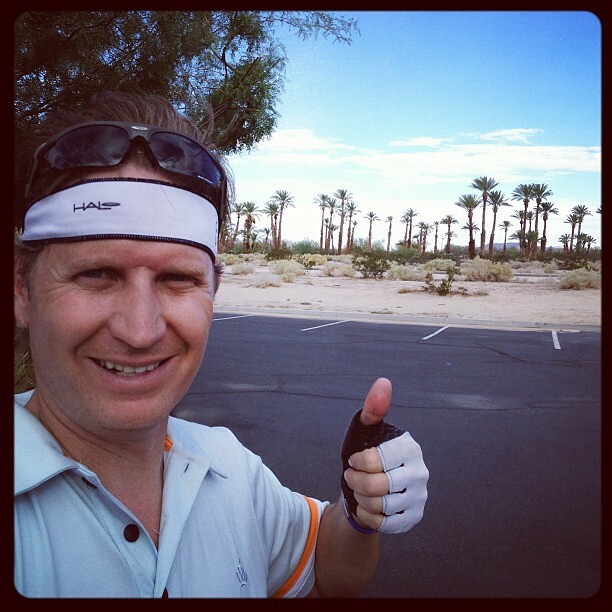 As for the bike’s feel, I have only ridden it a total of four miles so I will get back to you on that. Unlike my Rivendells, the Nordavinden is designed to eliminate toe overlap. That has not been a big deal on my Rivendells, but it can be annoying, particularly when riding in the city where there is a lot of inevitable stopping and starting. There is versatility in the tire widths I can use on this bike, with the maximum tire width being 35s. I could take this bike on dirt if I wanted, or keep it on the road. It’s nice to have choices. I am still deciding on what tires (both type and width) I will use. I don’t like spending a lot of money on tires, but I also want the ride to have a good feel. Suggestions? The Nordavinden is also made to take fenders. Yippee! Even though I sometimes dream of riding a fenderless road bike without a care in the world about a little rain, I know how I am. If I can avoid a rooster tail by applying full fenders, I will do it. 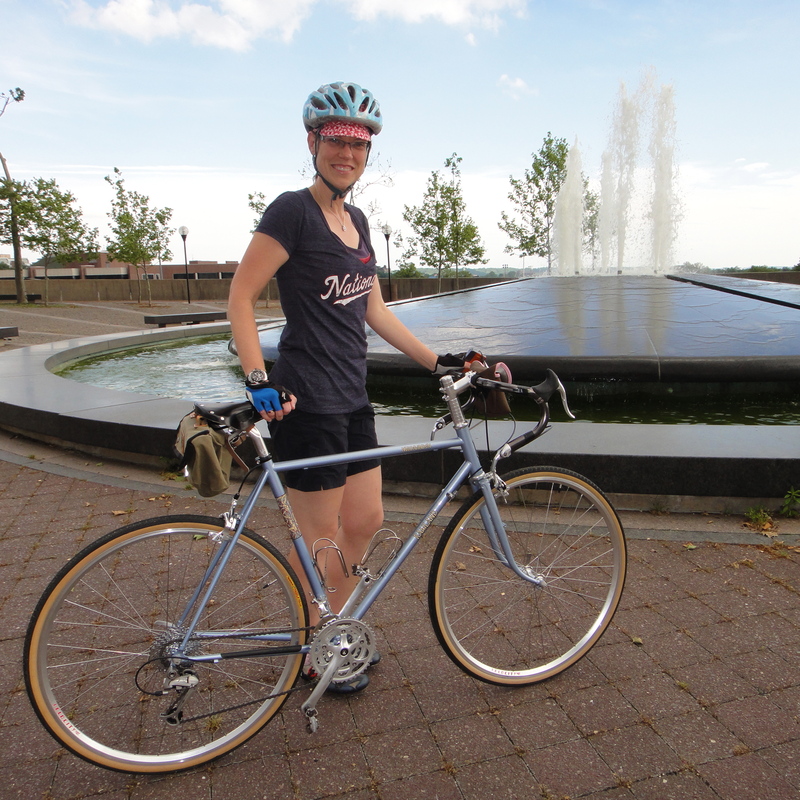 The bike’s price point suited my budget, with the frame and fork retailing for $725. Felkerino and I used as many parts as we could from the Dining Room Bike Shop to help with the overall cost of building up the bike. The Nordavinden will take a light load. It’s not a touring bike, though. In fact, it’s designed to take a front load. I’ve never been a huge fan of the big porteur bag, but I will likely use one on the Nordavinden. I’m still working through my front bag options. Do you have any ideas? For the moment, the bike has a small Carradice seatpack on the rear. College Park Bicycles did a great job taking all of the parts and getting the bike to where it is now. I will go into the parts spec some other time; I don’t have the bike finalized yet so explaining it would be premature. Also, I’m not a huge gear head so keep your expectations in check. It was a fun group project to put this bike together, though, so I will do a build post at some point. Over the next few weeks, I’ll be dialing in the fit of the Nordavinden and getting a feel for how it rides. I’ll keep you posted. What Word Sums Up Your Cycling Experience? I loved that you call it “New Bike Day”! Are there particular events or traditions involved? When Gary or I get a new bike, we have a tradition that it lives in the living room for about a week before joining the rest of the fleet. That’s awesome! Mine is living in our main hallway right now so it does have a place of honor at the moment, though it was somewhat inadvertent. I think the other tradition is taking it for a short ride with the bars not yet taped, and taking a few bike glamour shot photos. How exciting! Looking forward to your impressions, particularly how it compares to the rSogn. My Nordavinden is a smaller size than yours, fitted with 650B wheels and 42mm tires. It handles very nicely with a handlebar bag. As it happens, I rode the Nordavinden 100 miles earlier today. A wonderful companion. Glad to hear you enjoy riding yours. You have a pretty setup on that bike. I’d love to get out on a century with mine sometime soon. I’ll need to tape the bars first, though :). Soecialized Armadillo tires have become something of a religion w me. I had 25s on my Specialized, and they weathered two trips down the length of FL w nary a flat–even though our merry band had something like 20 flats each ride. None were mine. So the seven got Armadillos, too. She has 23s, and they’re Armadillo Elites, which are only 290 g each, but still Kevlar and all conditions. I ride them in DC, and they have good traction, a reasonable ride, and of course reliability. Very exciting news and I’ll be interested to hear about the riding experience, especially using a front porteur rack and/or rack. Good quality, supple tires are worth every penny but if you want to keep the price down good ole Paselas are hard to beat – nice ride, classic good looks and plenty of sizes to choose from. Congrats on the new bike. I know you don’t want to spend a lot of money, but I’ve put Gran Bois Cypress on my Hillborne, 32 mm. Super-supple, buttery smooth, and they went about 15 miles of light gravel/dirt last Sun. I love them. I will say it’s not even slightly correct to refer to this bike as a “touring bike” because the frame is not designed for a rear rack or panniers on either end of the bike. It’s really an “all road” or multi-surface bike which can blast on pavement and explore dirt roads, which is optimized for a French-style handlebar bag. I own 17 bikes and can honestly it’s not only my favorite and most ridden bike in my stable, but the best riding bike I’ve ever owned. It’s truly shockingly great. Sean and Rawland really nailed it with this design! (I have an rSogn, too, which I used for primarily off-road / dirt road riding.) Basically, if a ride is going to be 66% or more pavement, I ride the Nordavinden, but if there will be more than a third of the ride on dirt roads or trails, then I ride the rSogn. Thanks for writing, Chris. I updated the post based on your remarks and I am heartened by your description of the Nordavinden as it helps me clarify the difference between it and my Rivendell Romulus. I plan to use them for similar purposes but want to make the Nordavinden my “light” bike. Great looking machine. Every time I see others extending their already over extended bike collections I sleep easier knowing I am not alone. They’re made out here in Seattle and are top quality. I have a saddle bag and their Gilman luggage on my Brompton and love them both! Otherwise, that’s one good lookin’ ride! Enjoy getting to know it better and keep us updated as your relationship matures. Hey, Jesse, if you read this… which one is the smaller of the two? I am intrigued by these Swift bags! Standard rando bag, just with updated styling…I had one on my Vaya for a while. Forgot to mention, if you want more details than you thought you could ever need…give Swift a call and talk to Martina – She’ll steer you right! MG – I have a review of the Swift Polaris here. It is a very large bag and personally I would not recommend it on a bike like the Nordavinden. Of course YMMV. Great bag for my city bike. Yes, I actually looked at your review after seeing Jesse’s comment. Thanks for the review. After reading it, I think it is too much front bag for me, though I was checking out their smaller front bags. As far as tires are concerned: the Continental 4-Season in a 25 or 28 is a lovely, durable tire. I’d also look at the Michelin Pro4 Endurance (what was the Krylion) in a 25. Both of these are great tires that strike a nice balance between weight, durability, and performance. MG, are we talking about a large porteur bag or a handlebar (rando) bag? As you might know, I have the Ostrich bag and like it. It is a tad bit long depth-wise but that’s a petty complaint. Not sure yet. The large porteur bags intimidate me, but it might be a good fit for this bike. We’ll see. Glad the Ostrich is working well overall. A front rack and “trunk” bag combo might work well. Seen these on Grant’s site but you’ve probably seen these too. Huzzah for a new bike! I’ve been seeing Rawlands pop up in more places. I’d love to add one to the stable at some point. Let us know what you think after a few rides. Huzzah!!! I’ll let you know! +1 on the Paselas as an affordable supple tire; and +1 on the Swift bag. I’ve been using a pair of Short Stack panniers for over a year now and love them. They are pricey, but they are a classic design, and quality lasts a lifetime. Ooooh, new bike! I am so overdue for a new bike or two myself. Second it on the Grand Bois Cypres! Read about ’em on Jan Heine’s blog here: http://janheine.wordpress.com/2011/05/16/how-durable-are-grand-bois-tires/ I have them on a cross type frame and they have lots of varied miles on em–asphalt and dirt. (Currently waiting for my Rawland Stag, BTW) Enjoy! Everyone is raving about the Cypres tires… Okay, I might crack and purchase a set! Also, congrats on the Rawland Stag. Nice! I would decide on the rack before you decide on the bag. A porteur rack that attaches to the drop outs will stiffen the fork. This is what happened on my ti rando bike. this is good for carrying a lot of crap, but not the best on longer faster rides. a smaller rando rack is good, but you cant really fit a big fat porteur bag on it. think about how you want to use the bike. a courier bag flopped on a porteur rack works really well for city stuff, baskets work really well too. Thanks for that perspective, Ely. I had not thought about approaching it from a rack angle. I’m actually thinking of going w/ your brevet bag at first due to my hesitation with having a big front bag and seeing how that goes. I do not plan to carry a lot when riding the Nordavinden. That is, I don’t see myself using it for commuting really, but more for longer weekend open road rides. If you are not a fan of lugs why do you own lugged bicycles? There are many choices without lugs. I just found that comment odd. Hi Roger. I mean that I don’t live and die by having a steel lugged frame. Other bike properties are more important to me, but if I like the fit of a bike and what it does, it’s fine that it be lugged. May I inquire what size you got, and what your height and PBH is…I’m considering this bike and wavering between a S or M, thanks! I have a medium. I am 5′ 8″ and don’t know my PBH off-hand. In Rivendell I fit a 56 or 57 cm frame. Can get back with you on PBH in a couple days if needed. Pingback: Rawland Nordavinden Update: 44-Mile Shakedown Ride | chasing mailboxes d.c. Wondering if you ever installed fenders on your Nord? I just picked up the frameset, and tried to install my Planet Bike Cascadia feders, howeer the struts were too short to reach the front eyelet given the fork rake. Hi Bob, I have not yet tried to install any fenders. I currently have 32s on it, and think I’d need narrower tires to make any fenders fit comfortably. Interesting comment about the struts not reaching the front eyelet, though. Rather than attaching the strut to the dropout eyelet, you could attach them to the mid-blade, either on the inside or outside of the blade. This looks a bit unusual, but is actually VASTLY superior to mounting them at the fork tip, at least as far as safety is concern. Mounted at the fork tip, if something jams in the fender, the arc traced by the strut causes the fender to pull toward the tire as it gets rotated toward the fork crown. Mounted mid-blade, the arc traced by the struts is an increasing radius, and as the fender gets jammed toward the crown it gets pushed away from the tire. This makes a front fender collapse slightly less likely to send you over the bars. The mid-blade attachment should be closer, so perhaps try using that? Hi Daniel, thanks for reading and for your thoughts about trying out another option… still haven’t put fenders on mine yet. Hopefully soon. Thanks for the insight!! I actually have ordered a set of SKS Longboards for the Nord. They have a breakaway mounting attachment for the front, so should be a safe alternative. I’ve seen others seem to have been successful with these on the Nordavinden.